SailRaceWin: Spindrift racing series : “40 metres solo” - Happy 40th Birthday, Yann Guichard! Spindrift racing series : “40 metres solo” - Happy 40th Birthday, Yann Guichard! Not for Yann Guichard any crisis on turning 40. The skipper of Spindrift 2 celebrates his birthday today and just feels happy, surrounded by his loved ones and at the top of his sporting career. We caught up with him on the dock at La Trinité-Sur-Mer, Spindrift racing’s home port. Guichard has sailed on almost all types of multihull on the professional circuit. From the Tornado (the 6-metre Olympic catamaran) to the 40-metre maxi-trimaran Spindrift 2, Guichard’s life has been played out balancing between air and water. With three boys and three girls, the Guichard tribe is a large one, which has enjoyed moving around a bit. Settling in Paris, then Perros-Guirec and La Rochelle, the family liked to come together in the holiday home of the Ile aux Moines, in the heart of the Gulf of Morbihan. Between each cruise on his father’s boat, the children spent their time on the water. An independent spirit, Guichard followed his big brother into Optimist competitions. Jacques, the younger brother, chose windsurfing. He now designs the sails for Spindrift 2 and sails on board the maxi-trimaran. In sport studies from the 6th grade to the final year at school in La Rochelle, Guichard took the classic route and quickly shone. He got used to his oilies in the Optimist and then the 420. He learned his trade well. In 1994, he became vice-champion of the world in the 420 in Plymouth with his teammate Pierre Pennec. On their return, the duo did not want to continue on to the 470, they were looking for a boat that was more fun, one that could ‘glide’. There was a Tornado at the sailing club. One test was enough. Guichard and Pennec joined the ENV (France’s national sailing school) in Quiberon with the French team and began preparing for the Olympics, which concluded with a fourth place at the Sydney Olympics in 2000. Again, the return to France was the prelude to another change of direction. 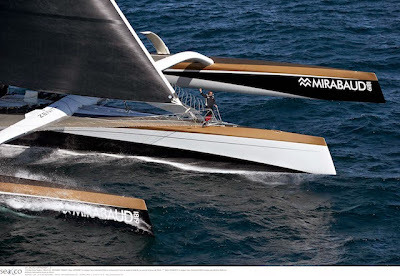 Marc Guillemot offered Guichard a place as tactician on board the 60-foot trimaran La Trinitaine. Guichard had a desire to go off shore and to discover other fast multihulls, while also preparing for the next Games in the Tornado with Christophe Espagnon. Over the next ten years, the adopted Breton led from the front in competitions off shore and those around three buoys. He did the double-handed Transat Jacques Vabre with Guillemot, Fred Le Peutrec and Lionel Lemonchois. In 2006, he sailed with Bruno Peyron on board Orange II and broke the record for the North Atlantic. That was a significant moment. They had just crossed the starting line, and despite rough seas and strong wind, Peyron entrusted the helm of the 37-metre catamaran to his new teammate. A man for challenges, Guichard came of age during that intense experience, which he repeated a year later with Franck Cammas, on board Groupama 3. The crewman then became the skipper for the 2010 Route du Rhum with the Gitana Team. Guichard has sailed with an incredible number of sailors from different backgrounds who have helped build his experience. With Dona Bertarelli, he shares the pleasure of competing at the highest level, the drive for perfectionism and the idea that you can always push the limits a bit further. As co-founder of Spindrift racing, the skipper has been strong presence at the head of a team of 30 people and a fast-growing business. He has learned how to delegate and knows how to surround himself with good people. On board, his teammates know that everyone has an equal voice. The skipper listens to his gut feeling and does not give his trust lightly. The team leader on the ground, and skipper at sea, Guichard has earned his stripes and the respect of his peers. For the record attempts on board Spindrift 2, he now has the responsibility of a crew of more than ten people and a trimaran of extreme dimensions. In November, the spotlight will turn to the soloist who will race the Route du Rhum alone on this huge boat. But once again, this is no whim, rather a mature, well-planned project. Nevertheless, at the foot of the ramparts of Saint-Malo, there will be some nerves. But for Guichard pressure does not inhibit, instead he uses it to gain confidence, because the harder the challenge the more he wants to complete it. -Winner of the Grand Prix E-GESTION de Gradson and 2nd in the Bol d’Or, M2 Safram.